A strong network is an important factor when doing business or championing a cause. 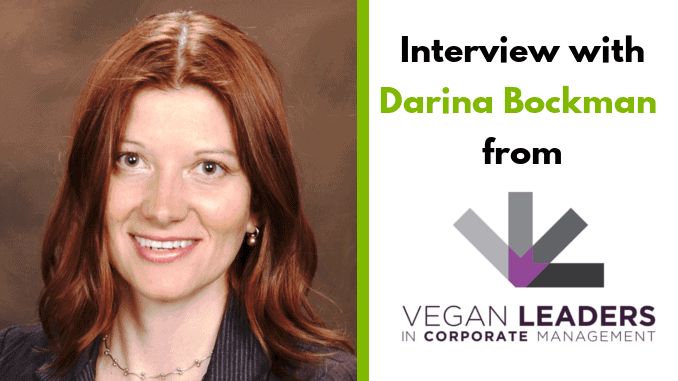 This was what Darina Bockman considered when starting “Vegan Leaders in Corporate Management” (shortened to VLCM) – a global network for business and corporate professionals who lived a vegan or plant-based lifestyle. According to the founder, there was a high demand for this, as evidenced by the network’s success. We interviewed Darina Bockman to learn more about this concept, the initiatives and the Vegan Leaders Playbook. What is the idea behind VLCM? The key idea was to bring together vegans who worked in large corporations. I felt a lot could be accomplished by mobilizing this community. I was myself a vegan working at a Fortune 500 company and it amazed me that I did not know anyone else like that. I was sure such people existed and must have felt just as lonely as me. I took it upon myself to create this new corporate and Fortune 500 focused vegan network. The purpose was three-fold: connect vegans within major corporate industries, plug these accomplished people into unprecedented vegan initiatives and lastly to change one for all the “fringe” perception of veganism by showcasing a line-up of powerful vegan corporate CEOs, vice presidents, directors and so on. I started VLCM as a LinkedIn group in late 2014. The group kept growing and so did our strategic vision. How is VLCM developing, how many members do you have? As of July 2018, VLCM had over 2,700 members in 77 countries. On average, we have 2-3 new membeers each day. Most people discover us online or get referred by other corporate colleagues. I still run monthly LinkedIn key word searches for Fortune 500 vegans and invite them to our group. Plus, new projects and media coverage notably tends to boost our growth. Who are the members, are they from small/medium companies or even from large corporates? Our main target audience are vegans in medium to large institutions, with an eye towards Fortune 500 companies. Vegan advancements at these top companies can move the needle the most, and vegan advocacy is arguable most difficult there. We currently have members at many Fortune 500 companies. The top ones are IBM (28 members), Microsoft (22), PriceWaterhouseCoopers (12), Amazon (11), major global bank (9), Deloitte (8), Ernst & Young (8) and Oracle (8). We also have several dozens of members working in the US government. We welcome vegans who work in small companies and non-profits if they work in a “corporate” (i.e. office/business) function and relate to our corporate discussions and initiatives. We intend to stay inside this niche as there are already plenty of groups focused on vegan businesses or general vegan advocacy. VLCM is still the only group focused on corporate vegans. You offer a Playbook, please explain what that is? The Vegan Leaders Playbook is our free how-to guide for anyone who wants to start a vegan initiative in their workplace, and is perhaps held back by fear, lack of confidence or lack of the right “formula”. We strongly believed many vegans could convince their employer to embrace vegan ideas – such as to adopt a plant-based policy or messaging in various corporate programs. One of the best ways to advance vegan ideas inside corporations is through the effort of vegan employees working there. Vegan ideas can be inserted into various company programs – environmental sustainability, health & wellness, diversity & inclusion or corporate responsibility. Vegan ideas even fit with angles such as innovation, “disruption”, thought leadership and other popular corporate values. The Playbook is a step-by-step blueprint for starting a vegan workplace initiative from scratch. Our team of writers had analyzed previous success stories and general self-help best practices. The Playbooks feature ideas for finding partners, winning support from executive sponsors and for boosting employee participation. It includes anecdotes, do’s and don’ts and even things like sample emails. Anyone can get a free copy of the Playbook (received by email upon signing up) from veganleaders.com/playbook. What further activities do you plan? We have a few exciting initiatives in flight. First, we just launched a Corporate Initiatives Support Program as a follow-up to the Playbook. People inspired by the Playbook can join the free 6-month program and work through their chosen initiative in a structured way with a mentor and as part of a group. The program helps break down the big idea into monthly goals and building blocks. We are currently accepting participants (up to 12) for the very first cycle which will go from September 1st, 2018 through February 28th, 2019. Secondly, we are also working on a campaign to persuade United Nations (UN) to promote a plant-based message predominantly (if not exclusively) under their global corporate sustainability program. We are also putting together a research study to compile metrics proving the vegan trend in the corporate world. We feel this could really boost the acceptance of vegan initiatives in more resistant companies. Meanwhile we grow and nurture our global VLCM community through our discussion platform and networking initiatives. Finally, we have begun the process of formally incorporating as a 501c3 organization. As of now, VLCM is managed by a small team of volunteers; we all have corporate day jobs. Establishing a formal organization will increase our continuity and allow us to do pursue funding and do more. How can interested people in companies connect with you? Interested people can join us through LinkedIn where we have an active discussion forum and our official member directory. Also, any general questions or suggestions can be submitted through our website form. We really appreciate this opportunity provided by Vegconomist to let readers know about VLCM! At this time, our operating model is not (yet) set up for sponsorships. We have done some one-off arrangements with third parties, mostly around cross-promotion. If any organizations or individuals would like to support us financially, please contact us and we can discuss. We’d love to find win-win opportunities but generally we are not looking to “monetize” our member base through heavy advertising and such. I am sure once we are a formal 501c3 non-profit organization, there will be more opportunities to work with sponsors.